Last week I escaped the winter for some much-needed R&R with my beautiful hubby. We decided to head to lovely Tropical North Queensland, a favourite region of ours. In fact, this was our fifth visit since moving to Australia 13 years ago. 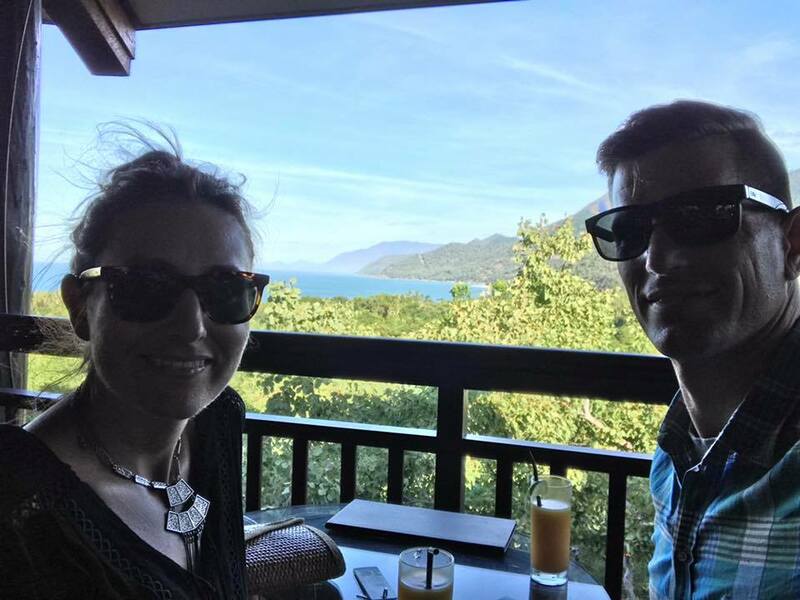 This was meant to be a relaxing holiday - no action and adventure for us this time around - and so I was delighted when I came across Thala Beach Nature Reserve and Lodge. Eco-certified for Advanced Ecotourism and recognised by the Global Sustainable Tourism Council, the lodge and bungalows set amongst the trees offered the perfect site for our winter escape. Just 15 minutes south of Port Douglas, I don't know how I'd missed this gem on previous visits. Driving onto the Reserve we wound through a stunning coconut grove that the owners planted when they bought the land in the 1970s. 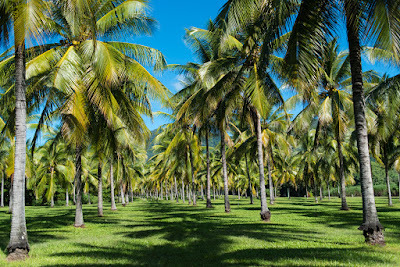 The owners of Thala have worked tirelessly to replenish the grounds after about two-thirds of the 145 hectare property was transformed from a definite sugar plantation into the natural wonderland it is today. I am in awe of the dedication of the owners who lovingly restored the land to the point that local plants and native wildlife now thrive on their property. We were spoiled by multiple nature walks on-site (they offer complementary guided walks, too, which we didn't take advantage of), as well as a stargazing evening where I saw the longest shooting star I have ever seen in my life, plus the rings of Saturn and the red stripes of Jupiter through their telescope. I was truly in nature and science heaven. We got lucky and were upgraded to a one of their Coral Sea bungalows, and honestly this was the view of my dreams. A charming bay surrounded by a eucalyptus forest, and perfectly positioned to enjoy afternoon sun and the beautiful colours of dusk. The lodge was built using sustainable building practices and materials, and designed specifically to fit into the environment. Apparently the space was approved for 6,000+ hotel rooms! They settled on less than 100. It's no wonder this resort was awarded the highest possible Eco-tourism certification. 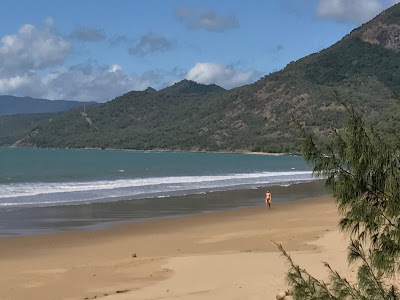 Many days we walked through the lovely forest trails to Oak Beach, a long stretch of natural beach with white sands and a stunning backdrop of green headlands. 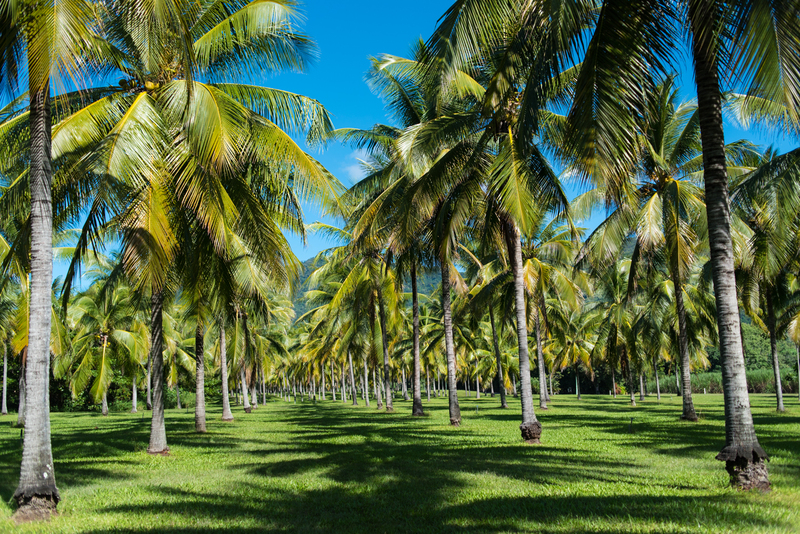 There are fallen coconuts scattered throughout, and a few hammocks strung in the shade of the coconut trees, and I was content to simply stare out at the beautiful surrounding for hours. That's me! And the closet bikini shot you'll get of me on a public website. incredibly beautiful as it hugs the coastline on the beautiful turquoise sea. I was surprised how little "beach reading" I did, actually. I'm an avid reader, but I found myself just staring and daydreaming more than anything. I truly found my bliss spot at Thala Beach Nature Reserve and Lodge, and I hope to return in the coming years. Despite the pristine nature of the beach, there was still some nasty plastic bits that made it to the beach - here's our little collection. 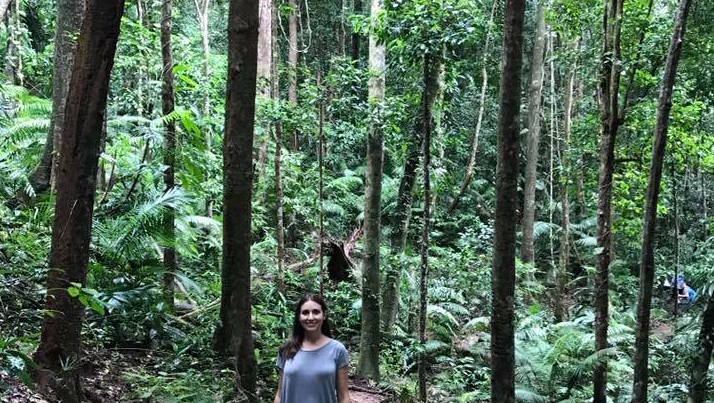 Enjoying some forest bathing in the Daintree. We did spend one day in the rainforest exploring Mossman Gorge, but otherwise this was a super-chilled break. Out of character for the two of us, but so appreciated! importance of slowing down and observing the wonders of nature. We did not spend a day on the Great Barrier Reef this time around, though I have had the pleasure of swimming and snorkelling the Reef a number of times on previous trips. A couple of years ago I wrote about the Great Barrier Reef. The situation is even more dire today, particularly in light of the Federal and Queensland governmental support of the Adani Coal Mine. This mega mine poses direct physical threats to the Reef as coal is transported out of Australia, but the biggest threat to the Reef is rising global temperatures. The latest reports suggest the Reef is officially dying. Warmer waters are to blame for the past two years' coral bleaching on the Reef, and we have lost 50% of the Great Barrier Reef over the past 30 years due to pollution and warming. However, I'd urge you not to think this means the region is not worth a visit. The Reef is still spectacular, and once you are amongst it personally the value of this magnificent World Heritage Area really become apparent. Besides, between the Reef and the other World Heritage site - the Daintree Rainforest - you are truly amongst some of the world's most beautiful natural sites. If you're as frustrated as I am about the Adani project, head over to the Stop Adani website and learn how you can get more involved. You'll be armed with further information about just how problematic this mine is - it's taking more than it's giving to Australia, and will undoubtedly steer us away from our climate targets. P.S. - I know some bloggers accept free holidays to destinations in return for articles, but this holiday was completely organised and paid for by yours truly. My opinions above are an unbiased, honest reflection of how much I loved our stay, and I hope some of you get the opportunity to stay in this magical place. The views from the bar and restaurant were spectacular!